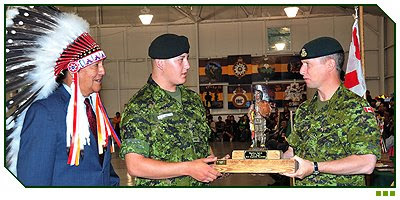 Private Desjarlais receives the Most Improved Award from LGen Andrew Leslie, as Aboriginal Chief Lawrence Joseph looks on. Wainwright, Alberta – Exercise Bold Eagle, a six-week program that combines First Nation traditions with the Army Reserve Basic Military Qualification, opens the door to the military for young First Nation people. In August, 57 newly-qualified young men and women received congratulations from Lieutenant-General (LGen) Andrew Leslie, Chief of Land Staff and Chief Lawrence Joseph of the Federation of Saskatchewan Indian Nations at the Bold Eagle 2008 graduation ceremony. Before the start of military training, recruits participate in a four-day culture camp which eases their transition into the military. The camp allows the elders of their community to explain the ways of the warrior and the traditions of First Nations people. Private Nigel Crow from Lethbridge, Alberta, zeroes his C-7 rifle.